ZCBJ Lodge emblem located above the hall's stage. 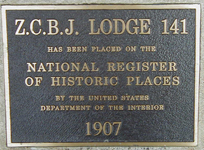 The Lodge began on April 17, 1904, as a fraternal association with the sole purpose of benefiting its members. 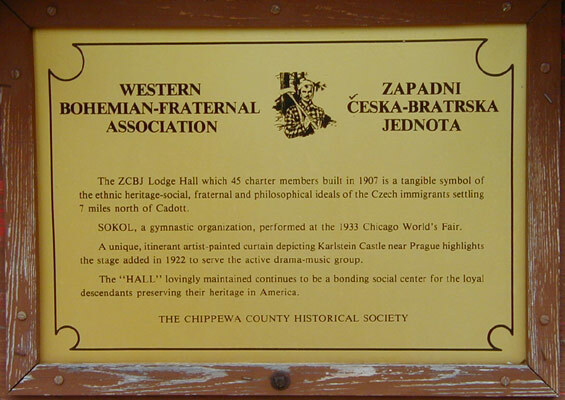 It became the center of social-humanitarian activities for the Czech settlers in the Cadott Wisconsin area. Hvezda Lodge #100 of Haugen Wisconsin sponsored the 24 charter members - 18 men and 6 women. 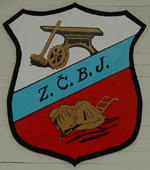 In Czech, ZCBJ is short for Zapadni Cesko Bratrske Jednota. This translates to Western Bohemian Fraternal Association in English. WFLA is short for Western Fraternal Life Association. ZCBJ Lodge - Bohemian Hall on Highway 27. This hall helps to keep alive the strong Czech heritage present in this area. It is listed on the National Register of Historical Places. The present hall was built in 1907 by the Bohemian farmers, mostly by volunteer labor and donated material, for $900. It is located 7 miles North of Cadott Wisconsin on Highway 27, at the junction of Bohemian Hall Road (135th Ave.), in the Town of Arthur, Chippewa County, Wisconsin. The primary structure was a 52' x 32' single frame building with a gabled roof built on a field rock masonry foundation. The embossed metal siding was installed in a contoured cement block pattern. The inside walls and ceiling are tongue and groove lumber running horizontally to the 52 inch painted vertical wainscoting. There are four 4-pane double hung windows on the north and south walls and a distinctive round stained glass window above the entryway. The balcony and main level floors are finished in fine hard maple -- important for the installment of their gymnastic equipment. A small trap door at the east end gave access to a small furnace room. In 1930, a 40-foot addition at the east end provided a stage for their regular drama performances and kitchen space below. A unique feature of the stage is a trap door for a prompter or allowing a director to be hidden from the audience and still direct the stage action. U.S. Department of the Interior plaque. 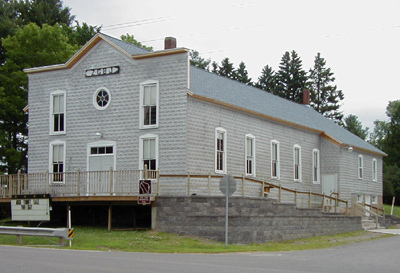 The Chippewa County Historical Society designated the hall as a Chippewa County historical site on June 14, 1989. On April 23, 1992, the hall was placed on the National Register of Historic Places. Chippewa County Historical Society and U.S. Department of the Interior (National Park Service) plaques, identifying the hall as a historical site, are located on the south side of the hall. The hall served as the center for Czech activities of all kinds and has been kept in exceptionally good original condition by the care of its dedicated members. Social events like dances and parties kept ethnic practices alive, but also served as a 2-way street in becoming part of the area. Charter members and family names not previously mentioned, which continue in the area are: Burich, Buresh, Cesik, Chapek, Charipar, Chmelik, Chrz, Cuhel, Dvorak, Ernst, Holub, Jandrt, Jiskra, Koska, Kosar, Koutny, Kral, Kucera, Kure, Kvapil, Kysilko, Matsche, Michal, Mlada, Moravecek, Motycka, Naiberg, Odenbach, Podhola, Prokupek, Prosecky, Rykal, Sebranek, Sedivy, Sedlacek, Sikora, Sobola, Stipek, Straka, Svoma, Tichy, Tomasek, Tvrznik, Vlach, Vlasnik and Vavra. Many of the early Czech settlers, as well as their descendants, are buried in the Bohemian National Cemetery. The cemetery is located 7 1/2 miles North of Cadott on Highway 27 in the Town of Arthur, Chippewa County, Wisconsin (1/2 mile North of the ZCBJ Hall). Chippewa County Historical Society plaque.